Recipe: Tarhana Soup ! | Do You Know Turkey | Turkish Tv Series & Drama, Turkish celebrities, travel information about Turkey and Turkish cusine. Home Cuisine and Recipes Recipe: Tarhana Soup ! Tarhana Soup is a traditional soup of Turkish Kitchen. It needs some effort and preliminary preparation. However result is worth while. Tarhana main ingredient of this soup is a kind of flour like powder. In our kitchens this powder is prepared in autumn so that in times of need powder is ready to cook. Here is the recipe of Tarhana. Cut the onions into the ring form and put bottom of saucepan. Slice paprikas and tomatoes put these pieces onto the onion rings. Wash parsley and dill and put top of all ingredients without cutting. Sprinkle the salt and boil all of them at low heat without open the tap of saucepan. After boiling open it and separate the parsley and dill bunches. Take saucepan from fire and let it cool down. When ingredients become cool sieve all of them. Throw away residual part above the sieve. Put flour in a wide pot and dish a small pool at the center of it. Put yoghurt and drawn ingredients into this cavity and sprinkle some salt. Knead all of them and get a hard dough. Put this into a quite deep pot cover it with a clean cloth. Along 10 days knead this dough for two times in a day for nearly about 2-3 minutes. After kneading for 10 days lay a clean large cloth. Chip small pieces from this dough flatter them and put onto the cloth to drain. Drain front faces for 12 hours then reverse them to drain other side of pieces. To understand whether pieces dry enough or not you can take one piece if it crumble without adhere your hand then it is ready. Take all pieces from the cloth put into the food processor to crumble into powder form then you can reserve for a long time. Put butter to the saucepan after melting add tomato paste then add 5 glasses of water. In an other bowl put powder of tarhana and add one glass of water. Stir them until tarhana become liquid become even. Add this liquid into the water that boils in the saucepan. Cook for 15-20 minutes flavor with salt, peppermint and red pepper. Serve it hot. Although making Tarhana soup is not as easy as other soups but it worths because it is so delicious and beneficial to health. So you should definitely try it. 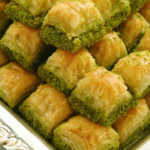 For more about Turkish cusine, please see our – Cuisine and Recipes section.